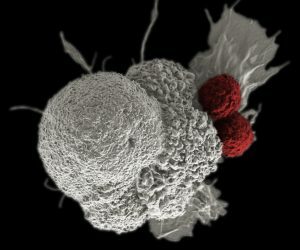 Imagine being able to program your immune system to launch one million minuscule heat-seeking missiles, whose sole purpose is to find and kill cancer cells. This is the basic premise behind an emerging form of immunotherapy, called CAR T-cell therapy, which genetically modifies an individual’s immune system to find, bind to, and kill cancer cells. A recent FDA approval of CAR T-cell therapy in childhood leukemia has put this breakthrough approach in the spotlight. NETRF has funded multiple research studies on CAR T-cell therapy in NETs since 2014. The Foundation’s first grant was to a pioneer of this therapy Carl June, M.D., and his colleagues Xianxin Hua, M.D., Ph.D., and David Metz, M.D., at the University of Pennsylvania. These colleagues continue to collaborate on NET research, with Dr. Hua leading an ongoing study. “These recent advances raise an exciting possibility that NETs can be specifically targeted via specific CAR T cells to effectively eradicate NET cells,” said Xianxin Hua, M.D., Ph.D. Most of the early CAR T-cell research focused on blood cancers, especially lymphoiblast leukemia, because these leukemia cells express a highly lineage-specific cell surface antigen that can be targeted by CAR T cells to eradicate the antigen-bearing cells including the leukemia cells. While NET cancer cells do not express a NET cell-specific cell surface antigen, NET cells tend to express abnormally high levels of somatostatin receptors (SSTRs) on their surface. Researchers hope that SSTR can serve as the antigen that attracts the killer CAR T cells. As its name implies, the backbone of CAR T-cell therapy is genetically engineered T cells, which work as the workhorses of the immune system to kill cells with surface antigens that can be specifically recognized by the engineered CAR T cells. The therapy requires drawing blood from patients and separating out the T cells. Next, the T cells are genetically engineered to produce receptors on their surface called chimeric antigen receptor, or CARs, which is tethered to T cell-activating modules. The CAR-expressing T cells, or CAR T cells, are programmed to cling to the specific antigen found on the surface of the cancer cell. Then they are “expanded” in the laboratory to created hundreds of millions of cancer-killing cells. The final step is the infusion of the CAR T cells into the patient. If all goes as planned, the engineered cells further multiply in the patient’s body and, with guidance from their engineered receptor, recognize and kill cancer cells that harbor the SSTR antigen on their surfaces. The first step in using this technology in NETs is to develop receptors to recognize SSTR as an antigen on surface of the neuroendocrine tumor cell. Dr. Hua and colleagues have developed a CAR system that can attach to SSTR-expressing tumor cells and kill the cancer cell. They have successfully tested the receptors in cultures, laboratory models, and are preparing next to test them in freshly isolated human tumor cells. “These studies will likely lead to the development of an entirely new and more effective therapy for NET patients who have failed previous treatments and save their life,” said Dr. Hua. Learn more about NETRF-funded research. Support research to cure NETs. This technology for NETs is still in the laboratory for the rest of this calendar year for the NETRF-funded study. I am not able to estimate when it might be tested in humans. That phase is not covered under the current grant. But we plan another article on CAR T-Cell Therapy to do a deeper dive in the coming months. And I will ask the experts what they think. We are just as hopeful as you are. Thanks for reading and commenting. I’m a patient (and healthcare provider) with NET’s, liver predominant, post surgery to resect small bowel,, post PPRT at Stanford. I’d like to participate in any trial involving CAT T-Cell therapy. I’d be willing to be a single patient pilot case, and certainly to be added to any mailing list you have for patients and clinical trials. Carcinoid cancer, well differentiated. Thanks so much for reading. Dr. Hua’s grant is only for laboratory studies of the technology in disease models and specimens. For all the basic/translational research we fund, it is our hope that the bench experiments will pave the way for testing in humans and make their way into routine use. So it is too early for any clinical trials recruitment. But please continue to monitor our progress and be part of our mission to cure NETS. I am sorry I don’t have any info on CLL. Our organization focuses solely on NET cancers. But I wish you the best in your search for new treatments. If you look at his bio, it has a link to his publications. His work on NETs has not been published yet. I would like to know if Dr. June & Team @ University of Penn shares his CAR T cell research for NETs with his colleagues @ the Parker Institute where he is also in Leadership – and vice versa. I hope all are sharing information and research to find a cure for NET cancer asap. Thank you! Daiva, I asked Dr. Hua and he is not sure. He has not worked with the Parker Institute on NETs and wasn’t sure about Dr. June. Because it is still preclinical, I think the collaboration has been more limited. If I have tissue from the Ilium Tumor that was removed. Then you could use it plus added chemistry to allow my own immune system to distroy the 5 remaining NET tumors? Is this correct?? And did you start trying it on NET patients? I don’t know whether excretory growth can be targetted with CAR T. No, it is not yet in humans. That is a little further down the line and not included in this study. Thank you Donna. I’d be happy to hear about the progress of yours findings. I’m looking for heel to my mother. The CAR T-cell research on NETs is still in the pre-clinical or laboratory stage. It is not yet in human clinical trials. We expect a presentation from the UPenn CAR-T team in late April at our annual research symposium for NETRF-funded researchers. I see that this project has a status marked as finished under funded research. What does that mean? It means the grant period has concluded, along with the NETRF funding. The researchers generally analyze and publish data following an investigation. Then they formulate a new study and seek funding for that study to continue the work. Each study seeks to evaluate very specific questions. Findings from one drive the next. Does that help? Is there any progress on this research, i saw a tweet from netrf Twitter account regarding partnership with penn university. After the presentation of the study, do you intend to start the experiment in humans? Will there be cooperation with other places in the world?